Just kidding, it’s still in the 60’s here. But I can pretend right? Mid-October is definitely time for pumpkin so I whipped up these pumpkin Belgian waffles last weekend despite summer still hanging on. These waffles don’t need much up-selling so I’ll keep this short and sweet. I was actually originally planning on sharing a different recipe, but I’ll save that one for next week so you can get right to these amazing waffles. 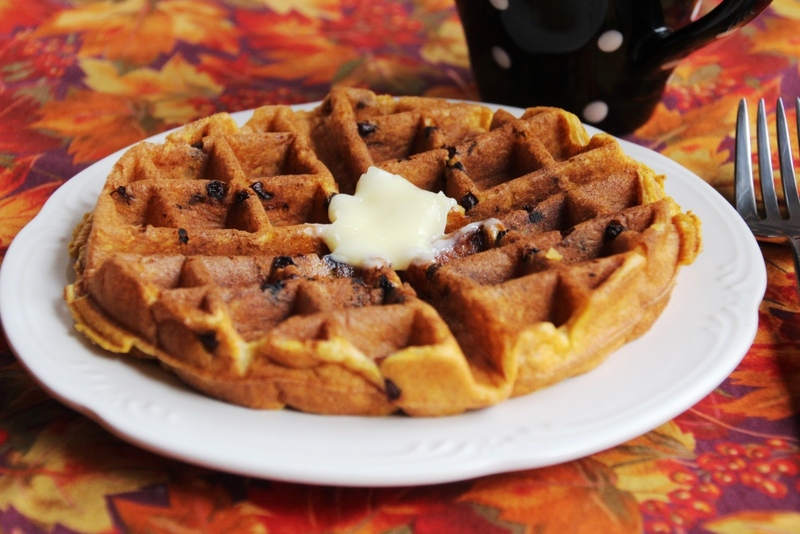 Not overwhelmingly pumpkin flavored with all the fluffy texture of your favorite Belgian waffle recipe, these are a delightful addition to your breakfast repertoire. The spice of pumpkin pie is subtle enough to blend with maple syrup but strong enough to enjoy them plain. Feel free to up the spices if you want them to be more prominent. I added a few mini chocolate chips to some of mine (as you can see in the pictures) but they are equally delicious without. 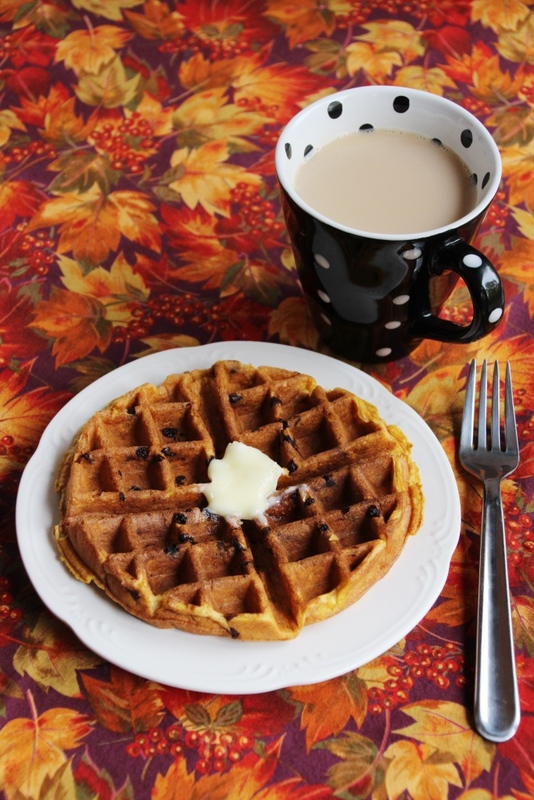 Note: Because pumpkin is so moist, these waffles will likely need to cook slightly longer than your usual recipe so I recommend turning your waffle maker about a half step higher. However, if you use leftover batter on subsequent days it will not need to cook quite as long as the batter gets less fluffy. On about day three I found I was going back to my usual setting of 5 instead of the 5.5 I used on the first day. Also, if you don’t want to make the leftovers on demand, it works pretty well to make them all at once and freeze them. Under cook them by a half step or so and let them cool on a wire rack. Then break them into halves or quarters (whichever will fit in your toaster) and pop them in the freezer. You may have to test a couple to see which toaster setting is best for you, but on mine roughly the middle of the dial was perfect. (You can also try defrosting them slightly in the microwave first if you’re concerned about them getting too crunchy before they’re warm all the way through.) If you have a toaster oven, I imagine that would work even better. Don’t be intimidated by the long list of ingredients; it’s an easy recipe despite quite a bit of measuring involved. Now, stop reading this and go make some waffles! In a large mixing bowl, whisk flour, baking powder, baking soda, salt, and spices until completely combined. Set aside. In a medium bowl, whip egg whites and cream of tartar until medium-stiff peaks form. Set aside. In a small bowl, whisk together egg yolks, milk, buttermilk, oil, pumpkin, sugar, and vanilla until completely combined. Gently whisk the milk mixture into the dry mixture until everything is moistened but still lumpy. Carefully fold in the egg whites (there should still be small puffs of egg white visible). Heat your waffle iron and spray with cooking spray if necessary. Add about 3/4 cup of batter and cook to desired doneness. 1 I also think they’d be great if you substituted ½ cup of the flour with whole wheat flour. Breakfast is my favorite meal of the day, and I don’t subscribe to the idea that it can only be eaten in the morning. I often make pancakes or stuffed French toast for dinner because who has the motivation for that kind of thing in the morning? My favorite breakfast is Belgian waffles. But not just any Belgian waffles. I’ve become a bit of a waffle snob and most just don’t make the cut. 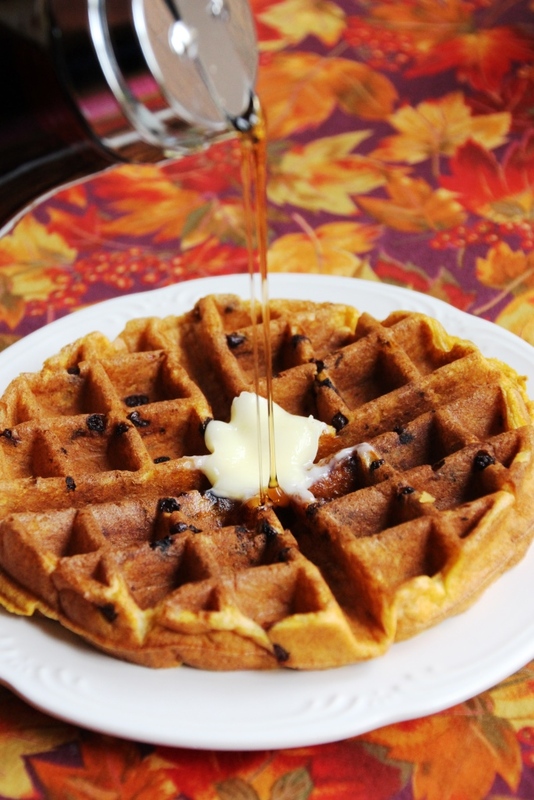 Restaurant waffles are generally too heavy and many people make “homemade” waffles from a mix. I almost never make anything from a mix because it kind of feels like cheating. Except with pudding, because you just can’t beat 5 minutes from box to spoon. The fancy glass makes it classy. These waffles are light, fluffy, and overall delicious. My favorite way to top them is with fresh berries and homemade whipped cream, although chocolate chips and peanut butter is a close second. It’s a fairly large recipe, so if you’re just cooking for one or two, you’ll want to cut in half. The batter keeps for a few days in the fridge (just give it a good stir) and will be just as delicious, but they won’t be quite so fluffy after day one. I frequently make a batch and eat one for breakfast (and lunch and dinner…) for the next several days. Below is my family’s recipe for the best Belgian waffles ever (as named by my mom), as well as one for homemade whipped cream. Prepare and preheat your waffle iron according to its instructions. Separate egg white into a large bowl (the one for your stand mixer, if you have one) and the egg yolks into another large bowl. Beat egg whites on high speed until light and fluffy. Add oil and milk to egg yolk and beat lightly. Whisk together flour, baking powder and salt and stir gently into wet ingredients until well blended. Let rest for 10 minutes. Gently fold in egg whites until mostly blended. Some fluffs of egg white should remain. Add 3/4 cup batter to waffle maker and cook to desired doneness. Garnish with toppings of choice and enjoy! Whip cream on high speed to very slightly less than desired consistency. Add vanilla and sugar and beat until combined. Notes: If you want to pipe your whipped cream, whip it slightly longer. Spoon it into a frosting bag with your tip of choice (I like a large star) and twist it shut with a plastic bread clip. I find it easiest to set it in a pint glass to store in the fridge.